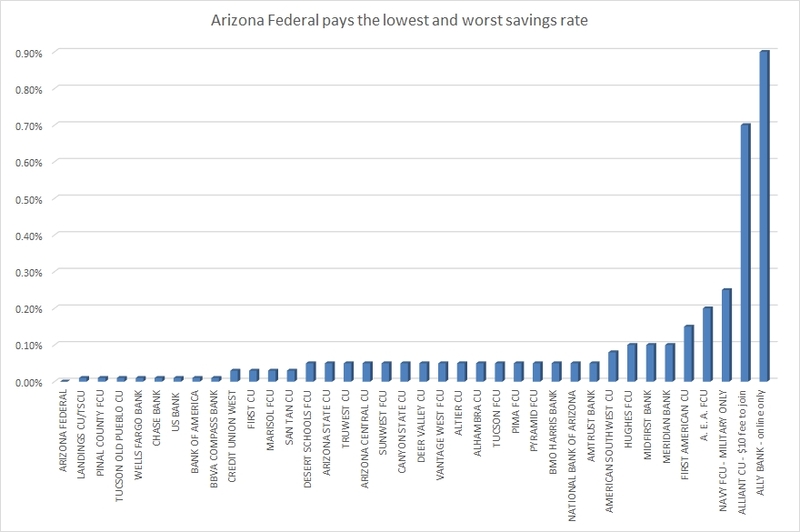 Arizona Federal pays the lowest and worst savings rate at AZFCU.org | Arizona Federal Credit Union has a new $3 Monthly Membership Fee! Greedy fatcat managers are forcing members to pay a mandatory $3 ripoff fee every month, simply for being a member. That's not mutually beneficial. ← Arizona FCU $3 monthly fee cannot be avoided unless you CLOSE YOUR ACCOUNT. Competitors offer easy options to avoid monthly fees. This entry was posted in charts images pictures, comparison spreadsheet, competition and tagged A. E. A., AEA, ALHAMBRA, ALLIANT, Ally, Ally Bank, ALTIER, AMERICAN SOUTHWEST, AMTRUST BANK, Arizona, ARIZONA CENTRAL, Arizona FCU, arizona federal, Arizona Federal Credit Union, ARIZONA STATE, ArizonaFederal.org, avoid, AZFCU, azfcu.org, bank, BANK OF AMERICA, banks, best, BMO HARRIS BANK, BVA COMPASS BANK, CANYON STATE, CHASE BANK, compare, comparison, competition, credit, Credit Union, CREDIT UNION WEST, DEER VALLEY, DESERT SCHOOLS, FCU, FEDERAL, FEDERAL CREDIT UNION, fee, fees, FIRST, FIRST AMERICAN, high, higher, highest, HUGHES, LANDING, LANDINGS, low, lower, MARISOL, MERIDIAN BANK, MIDFIRST BANK, NATIONAL BANK OF ARIZONA, NAVY, Phoenix, Phoenix credit union, Phoenix credit unions, PIMA, PINAL COUNTY, PYRAMID, rate, rates, SAN TAN, SUNWEST, TEMPE SCHOOLS, TRUWEST, TSCU, Tucson, TUCSON OLD PUEBLO, US BANK, VANTAGE WEST, WELLS FARGO BANK. Bookmark the permalink.